If you have a cheat meal or eat unhealthily every so often, that isn’t so bad (we try and follow the rule of eating an 80% clean diet). But, what if you’re eating badly and don’t know it? Sure, you stay away from deep-fried Oreos, but is your favorite “health food” snack keeping you from reaching your goals? Here are nine foods that have successfully disguised themselves as “diet-friendly” foods. Don’t let them fool you. Shocked? Granola is often touted as an outdoorsy health snack. Yet, it’s super high in calories and many variations are loaded with sugar and saturated fat. Solution: Go raw. Muesli is basically just raw granola and it tends to have less sugars and oils—but just in case, always read the label. If you are trying to lose weight, make sure to measure to keep your portion size reasonable. Frozen dinners are not as healthy as they advertise. Though many are low in calories (most range from around 240–400 calories), they are highly processed, lacking in nutrients, and brimming with sodium. Although they may seem convenient, you give up a lot in exchange for the convenience of a three-minute microwaved meal. Solution: Prepare healthy meals in bulk at the beginning of the week to deter you from having to choose these unhealthy convenient options. Or, if you absolutely must, read the labels. Some brands are better than others. Amy’s Kitchen, for example, does a better job than most. Note the word “sports” in the title. These drinks are specifically designed to replenish carbs, electrolytes and other nutrients during long, hard efforts. In any other situation, they’re just sugar water. You might as well drink soda. Solution: Generally, sports drinks are only useful for hard exercise going longer than an hour. Otherwise, you’re probably better off with water. However, if you’re eating at a calorie deficit and you’re having a hard time making it through your 30–60 minute workout, a little extra blood sugar might help, so experiment with a diluted sports drink. And again, read labels. High fructose corn syrup or artificial dyes won’t give you the fitness boost you’re looking for. Solution: Stick with simple homemade dressings, like balsamic vinaigrette, and, if you’re out, ask for them on the side to control how much you’re using. American-style muffins first came into popularity at the end of the 18th century…and never went out of fashion again. But, this sweet quickbread is hardly healthy. Take those tempting blueberry muffins you see at some classic coffee chains. They’ll pack on about 460 calories and 15 grams of fat. Not to mention they’re usually made with refined flour, tons of sugar, and goodness knows what preservatives. Solution: Almost all store-bought muffins should really just be avoided. If you’re really craving a muffin, try this flourless chocolate muffin that’s lower in calories and higher in fiber and other good-for-you components. Or, this plum bran muffin if you’re looking for a real fruit and fiber boost. As far as proteins go, fish deserves a high place in your diet and sushi can be a great way to enjoy it. However, most sushi is more rice than fish, and sometimes, it’s been deep fried (we’re looking at you, spider roll) or coated with mayonnaise (cue the dynamite roll and almost any sushi that has “spicy” in the name). While it’s never a complete junk food, like many items here, you can’t chow down without restraint and expect to see nothing but benefits. Solution: If you do rolls, try to choose rolls made with brown rice or those that are low-carb (in other words, rice free). Or, stick with sashimi. Don’t confuse these travel-friendly little bites that are low in fat, for a “healthy” snack. This carb-heavy, calorie-laden treat is almost completely devoid of nutrients and is often high in sodium. 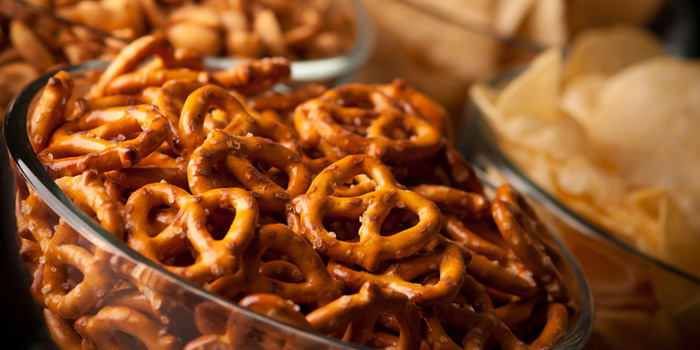 For instance, you’ll get an entire day’s worth of sodium in one cup of Rold Gold pretzels. Solution: Stick to nutrient-dense snacks like almonds, walnuts, pumpkin seeds, or sunflower seeds. Just keep an eye on the serving size if you’re watching your weight. Just because something contains the word “veggie” in the name doesn’t mean it’s healthy. High in fat and sodium, Veggie Chips are often extraordinarily high in fat and sodium and, honestly, not much better for you than potato chips. Solution: When snacking, eat your veggies raw—and dip them in hummus if you want to add flavor. What’s the problem with tea today? It’s mainly not tea! Most mass-produced teas come bottled with preservatives and designer drinks like chai lattes pump the sugar and additive content through the roof. Solution: Try Tejava (which is all-natural and just contains brewed tea), stick to unsweetened teas from your local coffee shop, or brew your own. It’s easy! So how bad is white rice? I thought there wasn't anything wrong with salmon rolls.